Ketchikan is often called the "Gateway to Southeast Alaska" as it is the southernmost city on the Inside Passage, and cruise ships often stop over in Ketchikan as either the first or last port of call on Alaska cruises. In 1900, Ketchikan was as a fishing and logging community, and now the 13,000 year-round residents of the town live along a 10 mile stretch of waterfront narrowly spread along the Tongass Narrows. Today the city is filled with tourists who come to Ketchikan to fish, hike, kayak, shop, learn about the Native American culture (especially totems), or explore the Tongass National Forest or Misty Fjords National Monument. 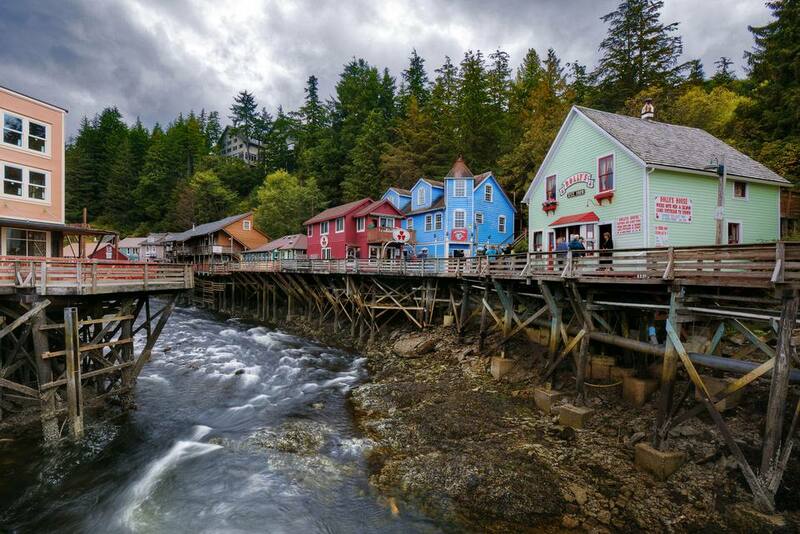 Ketchikan is also one of the rainiest towns in the USA, receiving about 13 feet of rain each year. Over 200 days each year have measurable precipitation, so don't forget your wet weather gear while exploring the exhilarating town. Until 1953, historic Creek Street was lined with bordellos frequented by the loggers and fishermen who worked in Ketchikan. Today, more than 30 wood-frame houses built on stilts along the creek are renovated restaurants, shops, and art galleries. Located about three blocks from the cruise ship pier, Creek Street is an easy walk to the downtown area. One of the oldest buildings is Dolly's House Museum. Dolly Arthur was Ketchikan's most famous "madam," and the interior of the house looks much like it did in the 1920s. Misty Fjords National Monument is about 20 miles from Ketchikan and can only be reached by seaplane or boat. The 2.3 million acre park is stunning, with massive glacial cliffs and secluded bays. The park is often foggy, with its peaks covered by clouds, giving it a mysterious ambiance. Small ships sailing from Ketchikan often include a day in the park, but its narrow fjords are inaccessible to the larger cruise ships, so visitors will either need to take a tour boat or see the Misty Fjords from the sky. The Deer Mountain Hatchery and Eagle Center was built in 1954 and is managed by the Ketchikan Indian Community. Located on Ketchikan Creek, the hatchery raises and releases more than 300,000 baby salmon each year. The Eagle Center is a rehabilitation center that cares for injured bald eagles and other birds. The Center provides guided and narrated tours to visitors and locals of the facility and operations of the Hatchery and Eagle Compound. It is open during the tour season, which runs from late April to the middle of September. Ketchikan is famous for its many totems, and visitors have many opportunities to see them either completed or being carved. The Totem Heritage Center is near the City Park and about a mile or so from downtown. It houses a collection of over 30 original, unrestored totems from Tlingit and Haida villages, most from the 19th century. Saxman Village is about three miles south of Ketchikan and has an impressive collection of totems and a cedar community house. Visitors can learn about Tlingit culture through songs, dances, and stories. Totem carvers are often at work in the village, and native art is for sale in the shops. The Totem Bight State Park about 10 miles north of Ketchikan is in a beautiful setting and was funded by the CCC of the 1930s. It has numerous totems with good interpretive signs, but no carvers onsite. The U.S. Forest Service's Southeast Alaska Discovery Center is on Mill Street in downtown Ketchikan. It features exhibits and interactive displays about the land, people, and culture of the region. Finally, there are outdoor totems at Whale Park, near the entrance to Creek Street. Although cruise ships offer fascinating shore excursions around Ketchikan, some visitors might prefer to pick up a map and do a walking tour around the town. The Ketchikan Visitors Bureau provides maps at its convenient location on the waterfront across the street from the historic "Welcome to Ketchikan" sign, the original of which first arched over Mission Street in the 1920s. Ketchikan has two self-guided walking tours. The first is the downtown walking tour, which takes about two hours or more, depending on how many times you stop to shop or take photos. This walking tour covers the parks, museums, churches, and historic downtown areas like Creek Street. It starts at the Visitors Center and ends just on the other side of the tunnel at the Casey Moran Harbor. The second walk starts at the Harbor View Park (near the end of the downtown walk,) and continues mostly along the waterfront. This tour is longer, and takes at least 2.5 hours, passing by historic homes and businesses. Ketchikan has several excellent hiking trails, including one to the top of nearby Deer Mountain. This 2.5-mile hike goes up 2,500 feet to the summit, providing excellent views of Ketchikan. The Rainbird Trail starts above the Third Avenue bypass and also offers amazing vistas. Other trails include two in the Ward Lake Recreational Area 7 miles north of Ketchikan—the Ward Lake Trail, an easy walk along a scenic stream; and the Perseverance Trail, which takes you into the rainforest. As the oldest gallery in Alaska, the Scanlon Gallery has a long history of supporting and featuring local talent. Founded in 1972, the gallery showcases original works in a variety of disciplines including painting, photography, woodworks, sculptures, ceramics, fine art books, and jewelry. The gift shop hosts a wide selection of books delving into the history of artists born in the state and an assortment of cute memorabilia that will make a great souvenir. Ketchikan, like all of Alaska, is a dream destination for those who love outdoor activities. Fishing is the most popular recreational activity in Ketchikan. Salmon fishing is king in the summer months, but halibut fishing is also a great option. Several local outfitters can set you up with a boat and guide. Kayaking is a beautiful, quiet way to see Southeast Alaska, and Ketchikan has at least two companies with kayaking tours. Zip-lining has really caught on around at vacation destinations around the world, and Ketchikan has zip-line adventures in the area.